"Routinely found at Chinese restaurants, this punch-like cocktail is absolutely mouthwatering. This goes great with Chinese and Polynesian food." Place the crushed ice in a large pitcher and pour in the gin, dark rum, 151 proof rum, light rum, vodka, grenadine, orange juice, pineapple juice, and lemon juice. Stir well to mix, then pour into a large, decorative cocktail glass and garnish with pineapple, cherries, and straws. This is the BEST!! Don't change a thing. I made these for a party and everyone begged for the recipe!! I had a Chinese New Year party this weekend, and EVERYONE loved this drink. I had been the only one who had it before, but it got rave reviews. Thanks! This is an excellent recipe, makes the perfect drink for a summer party. I have to say, this is a VERY tasty drink! I did add a liiiittle bit more pineapple juice, around an extra ounce or two, and it is perfect! Definitely a 4 1/2 or 5 star! Very good drink and easy, but be careful!! They pack a punch!!! 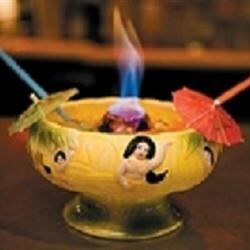 Perfect Scorpion Bowl in my book! I made exactly as written and it got rave reviews at a party I brought it too. Everyone wanted the recipe.